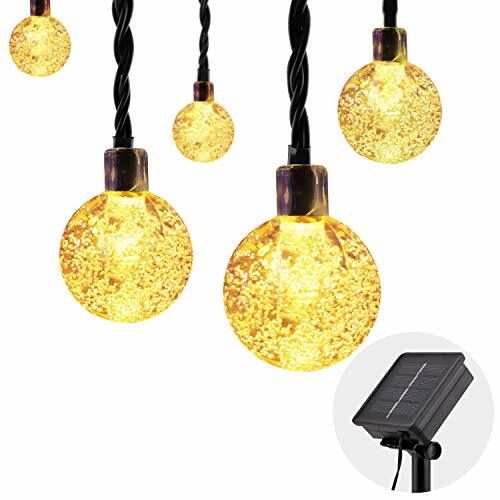 Solar Lights with Green and Environmental energy - powered by sunlight. Storing energy during the day and releasing light at night ! Glow At Night, Light Up Your Life ! SOLAR POWERED - Releasing light automatically at night for 6-7 hours after storing energy during the day for 6 hours. Efficient and environmentally friendly. Supports turn on/off manually by switch button. TWO MODES - 2 lighting modes available: steady on & twinkle/flash, perfectly meet your decorative lighting needs. PREMIUM MATERIAL - 6.5m/21.3ft 30 LED string light. Made from high quality ABS IP65 grade waterproof material. Durable and corrosion resistant. EASY INSATLLATION - This flexible wire allows you to hang the light in various surfaces easily and casually, such as trees and flowers. The stake of solar can be easily inserted into the ground.